When it comes to smoking or cooking on a grill there is always a chance of error. It’s easy to misjudge or mistime the cooking process and end up with over done or under done food. This can not only ruin dinner but also has the more serious potential to cause illness. Using a smoker thermometer will help you produce perfectly cooked meat every time. 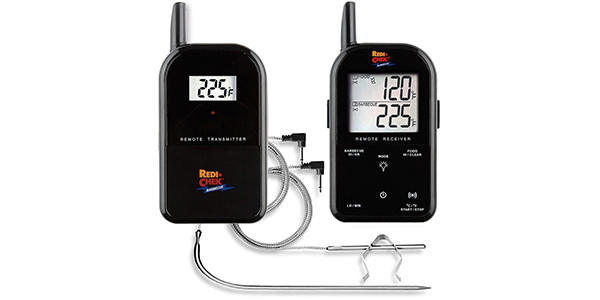 We take a look at the best smoker thermometers available today. We’ll also go over why you need a smoker thermometer and how to use a smoker thermometer to relieve any hassle or stress from not knowing what to do. 1.1 Why do you need a smoker thermometer? 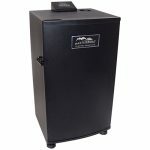 You may be thinking that your pellet smoker or your electric smoker already has a built-in thermometer, so why would you need another one? The simple answer is that the built-in ones are usually very inaccurate, you simply cannot trust them. They may be useful for giving you an estimation of the temperature of the air in the smoker, but when you need an accurate reading of the temperature inside the meat to see if it’s done to perfection or not then the only way to do that is by using a digital smoker thermometer. Not only do digital thermometers give you very accurate readings of the inside of the meat, but they are also so much quicker than dial thermometers. Dial thermometers sometimes take up to 30 seconds to give a stable reading. Digital thermometers can sometimes be as quick as 1 second. The difference is night and day. If you’re going to be cooking for a lot of people to a strict timeline and are relying on built-in dial thermometers then you’re asking for trouble. There is also no way to accurately tell how well done your meat is without a good quality digital meat thermometer. A lot of people will say they can tell by poking their hands. This is in no way accurate. It might work well enough for some people, but every cut of meat is different and everyone’s hands are different. Do not rely on this to test how well done your meat is. Likewise, don’t rely on the color of the juices or even by cutting into the meat, the best way to test is to stick your digital thermometer into the meat and get an accurate reading of the temperature. There is of course the analogue, built-in dial thermometer that we shall for the most part ignore. There are single probe thermometers that, as their name suggests, have one probe. These will usually be attached to a simple digital readout that tells you the temperature and will give you options for alarms or notifications. They can have a dedicated transmitter and receiver so you can take a readout of your temperatures with you. Included in the single probe thermometer category are the instant read thermometers. These are usually lightweight meat thermometers that can get a reading incredibly fast. There is a huge range of these types of thermometer and they are useful for all types of cooking, not just BBQ. We recommend having one of these at hand regardless of whether you have another type. They are so quick and easy to use that you’ll never cook without one again. Then there are the dual probe digital meat thermometers. These are the ones we’d usually recommend as it gives you the option to read the internal meat temperature and the air temperature of the smoker or grill. This allows for precision cooking and will make your life a whole lot easier. Dual probe thermometers come in several variations. There are the standard versions that are literally digital screen with two probes. There are the WiFi versions that usually have two displays. These are also generally called wireless meat thermometers. One display is connected to the actual probes that are in the smoker. The second display is for you to take around with you wherever you need to go. These are incredibly useful and allow you to set it and forget it. There is very little need to ever babysit your smoker again if you have a wireless meat thermometer. For example, you can go off and watch TV whilst the smoker is cooking your food. Then when the countdown timer reaches zero the small monitor that you take with you will tell you it’s ready. Many also come with alarms for if the smoker temperature deviates from the optimal. The last version is a Bluetooth thermometer. These work in very similar ways to the wireless meat thermometers but they will usually have an accompanying app on your smart phone instead of a second monitor and use Bluetooth rather than WiFi. These usually look like guns or hairdryers. They are battery powered laser thermometers that can give very accurate readings from quite a distance. The best thing about these is that they have a huge range of temperatures and can be used to get places that normal probes and thermometers can’t reach. 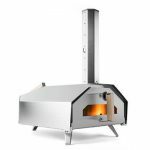 That’s why we recommend picking up one of these for any time you’re cooking in a pizza oven. We’ve done a quick guide to the best infrared laser guided thermometers here. 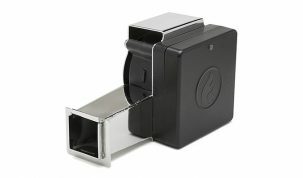 If you’re doing long cooks with charcoal or wood smokers or grills then a thermostatic controller will be a god send. You place the probe near the meat and close all the air intakes except one. There is a fan that will go over this intake and it will relay with the probe to regulate the amount of oxygen coming into and leaving the grill. This keeps a very accurate control on the temperature. 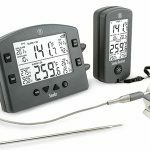 We’ve done a complete look and review of the best automatic temperature controllers for BBQ here. 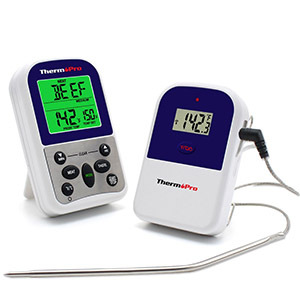 The ThermoPro TP20 is a wireless meat thermometer that has a wide array of features for a very reasonable price. 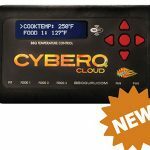 It comes as a duel probe set up and can accurately measure the temperature of the smoker and the internal meat temperature from up to 300 feet away. If you’re at all serious about smoking great BBQ then the TP20 is the one of the best smoker thermometers you can get for the money. The durable design and build of the transmitter, the receiver and the two included temperature probes are just about the best you’ll get at this price point. 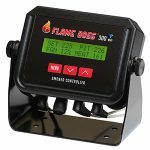 It’s easy to use with a clear, LED backlit LCD display. 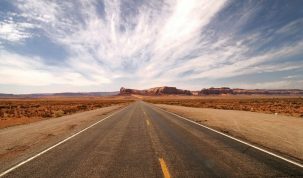 It’s easy to set up as it has a simple interface and large screens. It has enough features to cover almost every possibility. Alarm alert for user programmed temperature or timer. Countdown and count up timer with two-time duration options. Timer and temperature settings are saved when unit is powered off. Overall, if you’re looking for a good quality, cost efficient, feature rich meat thermometer then the ThermoPro TP20 is a great choice. Read our full ThermoPro TP20 review or check the latest price on iTronics (ThermoPro) website. If you’re looking for a slightly cheaper option that has a single probe then the ThermoPro TP11 is one of the best single probe smoker thermometers you can buy. At almost half the price of the TP20 you’re getting a lot for your money. You get a food probe that attaches to a transmitter and a receiver that has several preprogramed temperatures for different types of meat. The receiver also has a black lit screen that changes color depending on what stage your meat it is. It also has an alarm and a countdown and count up timer. Temperature Range: 16˚F to 482˚F (-9˚C to 250˚C). Temperature Accuracy: ±1.8˚F (±1˚C) from 32 to 212°F (0 to 100°C). Probe Length: 6.5″ food grade stainless probe. Cable Length: 40″ stainless steel mesh cable. Remote Range: Up to 300 feet. 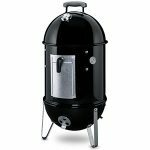 The major differences between this and the TP20 are that this has a single probe which can be quite limiting if you’re looking to accurately smoke or grill. The temperature range on the TP11 is also smaller than the TP20. If you’re just planning on simple smoking with this thermometer then the small temperature range won’t be a problem. A few people have reported problems with the probes themselves and having to replace them soon after being bought. The one we tested worked fine but we don’t actually own this model so can’t comment on the longevity personally. Having said that, this is a great quality smoker thermometer that is packed with enough features to make perfect smoking easy. You definitely don’t need a second probe, although it does help, but this will be more than enough for a lot of people. 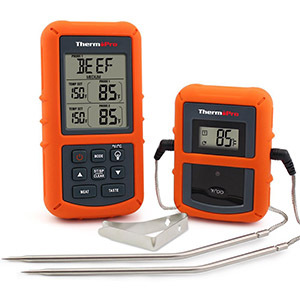 If you’re looking for a quality single probe digital meat thermometer then the ThermoPro TP11 is one of the best you can buy. Check the latest price on the iTronics (ThermoPro) website. Receiver alarm beeps and flashes to alert the user that the temperature is above or below optimal range. Real time display on the transmitter. Overall, the Maverick Et-732 is a fantastic, tried and tested digital smoker thermometer. 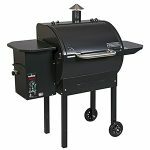 It’s got a good accuracy, high reliability and makes smoking and grilling a whole lot easier. There are a couple of problems people have had regarding it not working properly, but if you read the instructions thoroughly and follow our tips that we mention later on you should be fine. We’ve had slight temperature fluctuations here and there but nothing major. We still think this is one of the best smoker thermometers out there and would recommend most of the Maverick products we’ve used. 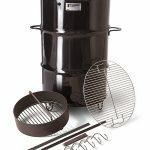 If you’re looking for a top quality dual probe BBQ smoker thermometer then this is a great consideration. We’ve reviewed the Maverick ET-733 here. The Kizen is an affordable instant read thermometer that has the features of a very high end one. It’s well built from plastic, but feels sturdy. It can take temperatures in 4-7 seconds and is so simple to use. There’s a nice sized, bright LCD screen and if you can’t see that for whatever reasons it even has a built in voice read out system so you can audibly tell what the temperature is. The probe itself is of a decent quality, it has an ultra thin probe tip to make as small a possible mark on the meat which is a nice feature. The probe is foldable for easy storage and the thermometer will turn itself off after 10 minutes to save battery. Temperature range of -58°F to 572°F (-50°C to 300°C). Temperature accuracy of ±1.8°F (±1°C). For such a simple device Kizen have managed to add in a lot of really nice features. It’s super easy to use, very accurate with a huge temperature range and it’s much cheaper than certain alternatives. We think if there’s one thermometer that you should own from the list then this is that one because of its versatility and price. 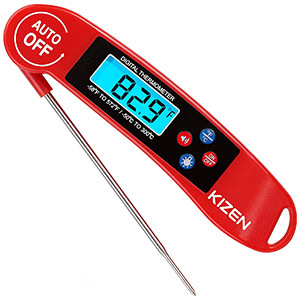 If you’re in the market for an instant read thermometer then the Kizen is one of the best value instant read thermometers you can buy. If you’re looking for something with a bit more quality, then we highly recommend the ThermoWorks Thermapen Mk4. It’s quite expensive but is the best instant read thermometer you can buy today. We didn’t make this our top choice due to the Kizen providing a lot of what the Thermapen Mk4 does at a much lower price. 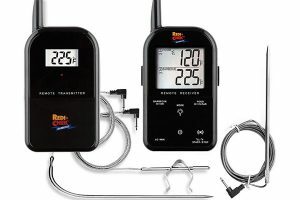 Bluetooth smoker thermometers are becoming more and more popular as of late and there’s a good reason for that. The ease of use of a Bluetooth thermometer is way above anything else. You can have all the data sent straight to your smart phone or tablet which reduces the number of things you have to carry around with you. 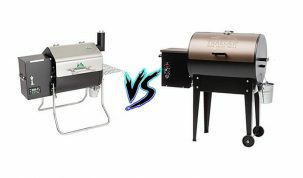 The iGrill2 is the best of the bunch and the complete master kit is as good as you’ll get for the price range. 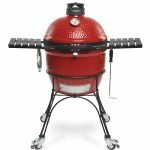 The iGrill2 features four probes in total, three meat probes and an ambient probe. This means you can be cooking several different meats and keep a very detailed look at all of them from your smart phone. As it’s about as digital as you’re going to get there are a lot of features that just aren’t available on anything else. You get full custom and pre-set temperature alarms and a min/max temperature range. There is also full graphing and exporting of the data so you can see exactly how your smoker faired during cooking. Overall, the iGrill2 is a very versatile, very accurate smoker thermometer that takes a tried and tested formula and successfully mixes it up a bit. The Bluetooth can sometimes cut out and does have to be synced every time you want to use it. It cut out very rarely for us and syncing only takes seconds so neither are much of a problem. 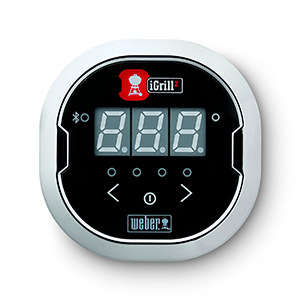 If you’re looking for one of the best meat thermometers for smokers then you should definitely consider the iGrill2. 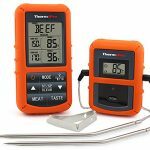 For a lot more information on Bluetooth thermometers, check out our guide to the best Bluetooth BBQ thermometers on the market today. Firstly, make sure all your connections are pushed in hard. There have been several reports of disgruntled customers thinking their thermometers are not working when in actuality they just haven’t read the instructions properly. A lot of people simply needed to push the probes into the monitors further. One of the most important parts of using a digital smoker thermometer correctly is the placement of the probe. If you’re looking to place the probe on the outside of the meat then we recommend keeping it around 2” away from the surface of the meat and about 1” above the grate. Feel free to play around, but you’ll see some surprisingly drastic changes in temperatures with very little movement of the probe. You can use one of these clips to hold the probe in place. Or some foil. Both work fine. When measuring the temperature of the insides of a piece of meat then it is important to take the reading in several places. Always read the lowest temperature and try to go past the center with the probe. Insert and remove the probe nice and slowly and keep an eye on the readings. The best way to use your smoker thermometer is to use it with our smoking times and temperature tables to make sure you cook your meat to perfection. Always keep under the temperature rating. This is one of the biggest killers of digital thermometers. It’s easy to accidentally touch the grill which could be hundreds of degrees above the recommended max temperature. Going above the maximum is likely to damage the cable that the probe is attached to. That’s about it. We hope you found this useful and found the best smoker thermometer for you. If you’d like to know more or have any questions then please contact us or use the comment section below.